High-quality early learning, frequently experienced in a child care setting, prepares children for both school and a lifetime of success. While quality early learning is beneficial for all children, its greatest impact is on children from less advantaged households. One of the most important outcomes of a quality early learning program is its ability to narrow the school readiness gap by preparing children for kindergarten through their development of basic literacy, math and science skills, as well as social and emotional health and behavior. 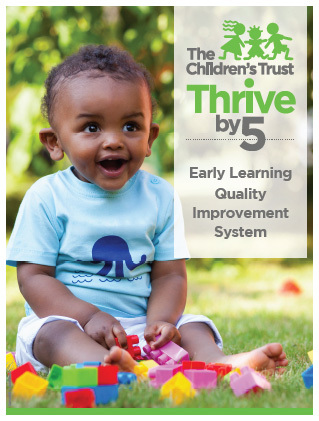 With the inception of Quality Counts in 2007, Miami was among the first communities in the nation to implement an early learning quality improvement system. Now, more than a decade later, every state is on board and Miami-Dade County is once again at the forefront with an innovative new model. Through an intensive review of our data and multiple Quality Counts evaluations, we’ve learned that programs need financial assistance to afford the high cost of quality care, so this and other barriers will be addressed in the new model to improve infant and toddler care in low-income neighborhoods, leveling the playing field for all children. Miami’s upcoming, innovative quality improvement system (QIS) will be the heart of a broader investment strategy called Thrive by 5.